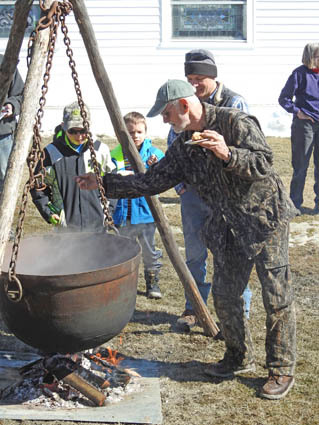 Fred Bradley demonstrates old-fashioned maple sugaring in a cast iron kettle over an open fire during Maple Festival in Middletown Springs. Sunday, March 18, 1 p.m.—MIDDLETOWN SPRINGS—Maple lore and demonstrations, sweet treats from local kitchens, a raffle and a silent auction featuring local artists and craftspersons, merchants and professionals highlight the 30th annual Maple Festival of the Middletown Springs Historical Society on Sunday, March 18 from 1-4 p.m. The event will feature a demonstration of early maple sugarmaking in a cast iron kettle over an open fire. Local sugarmaker Ryan Mahar and historians David Wright and Jon Mathewson will give a presentation on maple sugaring history and current practice using examples from the Historical Society collection. Delicious maple desserts created by historical society members, Vermont maple products and new 2018 syrup will be available for sale. Pancakes, old-fashioned sugar on snow and maple cotton candy are always favorites. Acoustic music and kids’ activities enliven the free afternoon event. Videos about Vermont maple sugaring will be shown continuously. Silent auction offers include a stay at a vacation condo; Killington ski and golf passes; 100 gallons of heating oil; genealogical research; lessons in billiards/pool, spinning, or horseback riding; computer consulting; a wine and cheese basket; a Cabot cheese basket; a planted container of annuals; a homemade quilt as well as other fine craft items; homemade pies; maple syrup; a Vermont Teddy Bear; dining gift certificates and other donations from area businesses. A raffle drawing with many prizes including $100 and $50 in cash, maple syrup and maple products, craft items, and gift certificates from local businesses will go on during the festival. Museum exhibits on Middletown Springs history are on view during the festival. Admission is free and the building is handicap accessible. For more information, call 802-235-2376 or 802-235-2421.